What lets you know the mood of the party? The music! Who keeps the music going all night long? Your DJ! DJs are an essential part of any fun and upbeat event because they keep the people moving and the party going. Rokstar Events prides itself in this area. Our fun, outgoing, and polite DJs will keep your event at it’s best all night long. With the help of Rokstar Events, any event, no matter what size, can be made into “The Party” your friends and family will talk about for years to come. There are some services that we believe a client should receive by default. Why pay extra for more microphones, request cards, or anything else that you deserve for nothing more than free? Rokstar Events will go above and beyond to cater specifically to your own personal party needs. 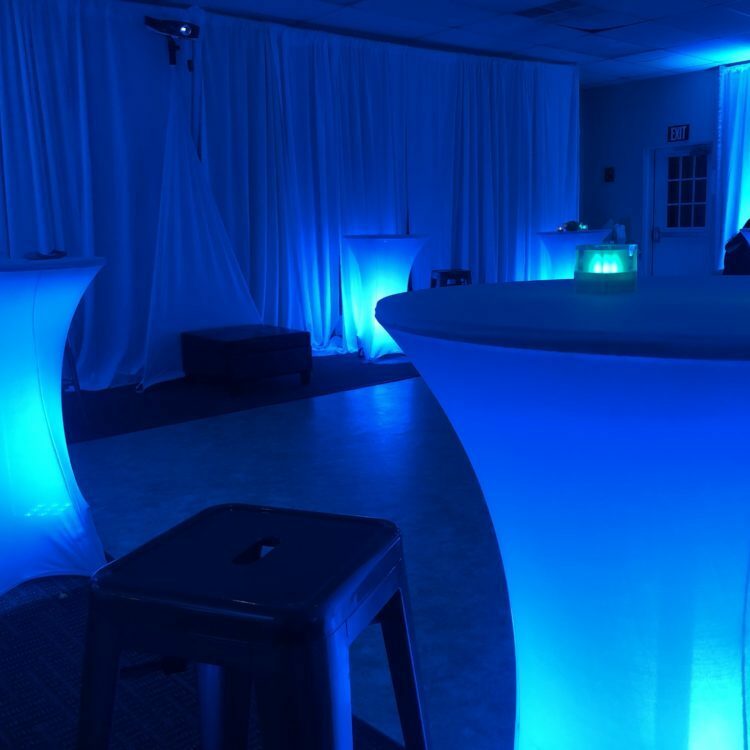 From an ambient glow in the color of your choice to a dancefloor that could be mistaken for a nightclub, lighting can completely transform the atmosphere of your event. We offer a range of lighting packages to help you achieve exactly the mood you want in any room. 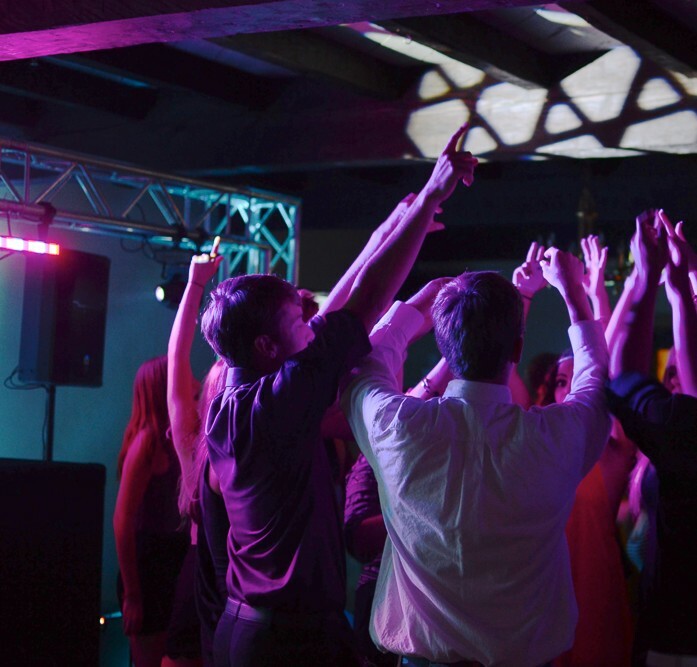 Our skilled Lighting Coordinators will tailor state of the art LED lights to the theme, music, and color scheme to make the entire space feel like a part of your special night. One of our most popular options to compliment absolutely any event is full room uplighting. 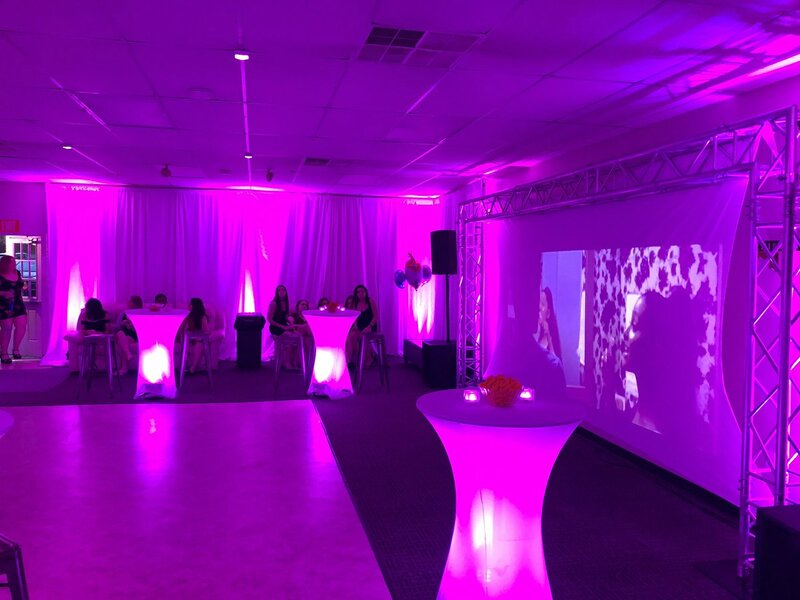 Uplighting is available in the color of your choosing, and can highlight a specific area of the room, such as the DJ, or be placed along each wall to create an overall effect. 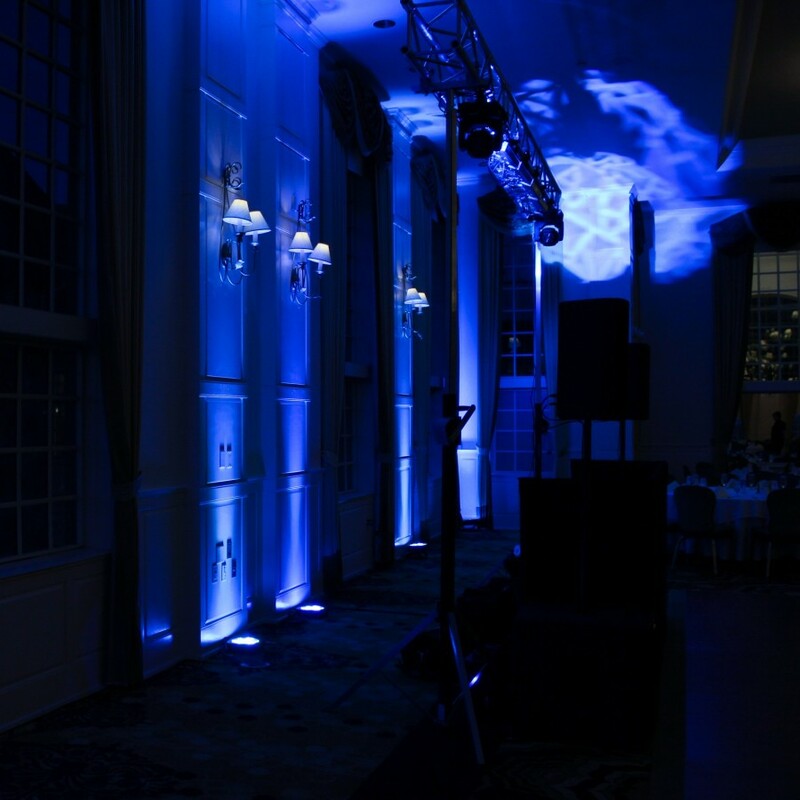 Uplighting is customized for every event space, and may be as simple or elaborate as you desire. Everyone loves pictures with friends and family, and no one wants to be the one behind the camera! Grab some props for a memorable moment and let our photo booths capture the whole gang – don’t worry, we’ll print a copy for everyone in the picture. After your event, you’ll receive digital access to all of your photos, making them available to share online with your guests and download individually. A client favorite in combination with the photo booth are our memory books, where guests can leave an extra copy of their photo strip and a special note for the host to keep forever. 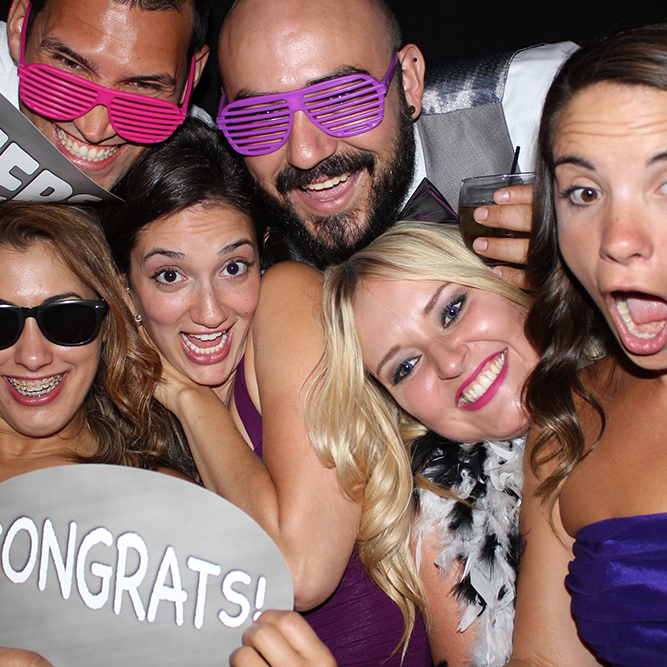 Our photographers will capture the happiest moments of your life while you and your guests focus on celebrating! Professional grade equipment ensures high quality, high resolution photos that will last you a lifetime. Our photographers have years of experience in event photography, which means that your pictures will look beautiful even in dimly lit rooms, clothes will be true to color, and even candid shots will be crystal clear. All of our photography packages include unlimited digital access to your photos for both you and your guests in addition to the option for multiple shooters, to capture your event from all angles, as well as on site editing and printing for you and your guests. Events are a place for guests to catch up and have fun. Why not let them do so in style? Our furniture will set your event apart from the rest. Want ottomans, high top tables, or defined perimeters? No problem! Our team will customize a unique atmosphere for your guests. Don’t worry – we’ll uplight everything as well. Once again Rokstar Events did a stellar job at our event. They are so professional and courteous. The dance floor was full all night. Thanks for providing the best entertainment and making our event so memorable.